Mora of Sweden is now the maker of all models of Mora knives. At one time there were three makers producing knives in Mora, Frost, KJ Erikson and Mora. Over time these companies have consolidated in one, Mora of Sweden. They now produce a large number of models used for a variety of purposes. Mora knives are very popular and can be found in a large number of stores. I have decided to only list a small number of models, ones I think are popular, reasonably priced and very useful. Don't be fooled by the low price of these knives. It does not translate to cheap quality. The steel on Mora knives is exceptional and will do anything you want it to do in the field. Where they cut costs is by making plastic sheaths rather than leather and plastic and rubber combination handles rather than birch or curly birch handles. Everyone that spends time in the bush should have at least one Mora that they carry on them or in their pack. These are quality knives at an exceptional price. The green Mora heavy duty companion has a plastic sheath, a plastic and rubber combination handle and a carbon steel blade. The rubberized handle provides a sure grip when using this knife for hunting, general use or bushcraft techniques. The sheath has a belt clip on the back to slip and lock over a belt up to 1 3/4 inches wide. 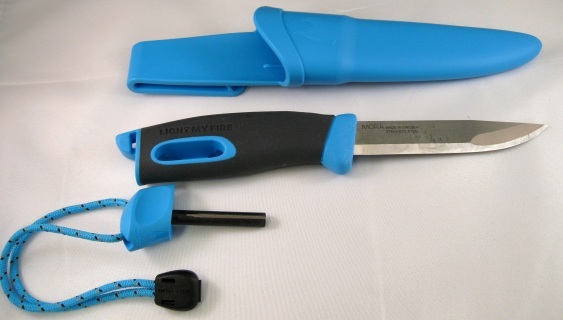 The knife snaps into the sheath for a secure fit. The blade is thicker on the heavy duty companion so it will stand up to most chores you use this knife for in the field. Overall length: 9 1/2 "
The orange Mora heavy duty companion has a plastic sheath, a plastic and rubber combination ahndle and a carbon steel blade. The rubberized handle provides a sure grip when using this knife for hunting, general use or bushcraft techniques. The orange color makes this knife stand out compared to other knives. When you set this knife down on the ground, you will not lose it since it does not blend into the grasses, leaves or brush when you are out in the field. Many of us have lost knives because of this. You will not lose your orange Mora! Swedish FireKnife has a half tang blade of hardened Sandvik 12C27 stainless steel and a handle with a high friction rubber grip which is comfortable, easy and safe to use. The sheath comes with a drain hole in the bottom. Profile grinding makes the blade fine enough for most chores you would use this knife for in the field. The back of the blade is ground to work perfectly with the Swedish FireSteel which is inserted in the handle when not in use. The Swedish FireSteel is durable and you should expect more than 3000 strikes. The steel works equally well when wet and creates a 2980 degree spark for lighting your tinder. The spark will light a stove, tinder, BBQ, paper, dry grass, birchbark or any other prepared tinder. The Swedish FireKnife comes in different colors, blue, red, orange, black or green. Please attach a note to your order if you have a color preference. Not all colors are available all the time. I will email you to let you know what is available prior to sending out your order.